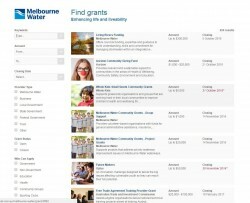 Melbourne Water has created a new site called Find Grants to assist individuals, community groups and Councils to locate funding for projects that enhance liveability through recreation, active transport, urban greening, cultural heritage, public artwork and signage, community events and the environment. The website allows potential applicants to search across hundreds of grant programs and provides direct links to grant providers. It’s a brilliant resource for all stakeholders who need additional funding to realise their waterway and livability projects.